Colin Daniel (right) is a Posh summer signing. Peterborough United manager Steve Evans insists he has already dramatically improved his first-team playing squad. Highly-rated young midfielder Louis Reed became Evans’ eighth summer signing this week when moving from Championship side Sheffield United for an undisclosed fee. Reed (20) signed a three-year contract to end a four-year pursuit by Evans. “I’m very happy with the way things have gone this summer,” Evans said. “I’m blessed to have a chairman who backs his manager without question and I’m lucky to have Barry Fry making the deals. 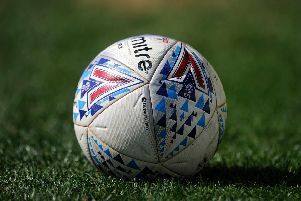 “I wanted 12 new players before the players report back for training next Wednesday (June 27) which now looks optimistic, but eight is not bad going and we might get a couple more soon. “We have signed three of my top midfield targets in Louis, Mark O’Hara and Alex Woodyard, but there’s also a fourth midfielder towards the top of my list and we are working hard to get him as well. “We want to be working with a squad of 22 players next season and we are getting there.